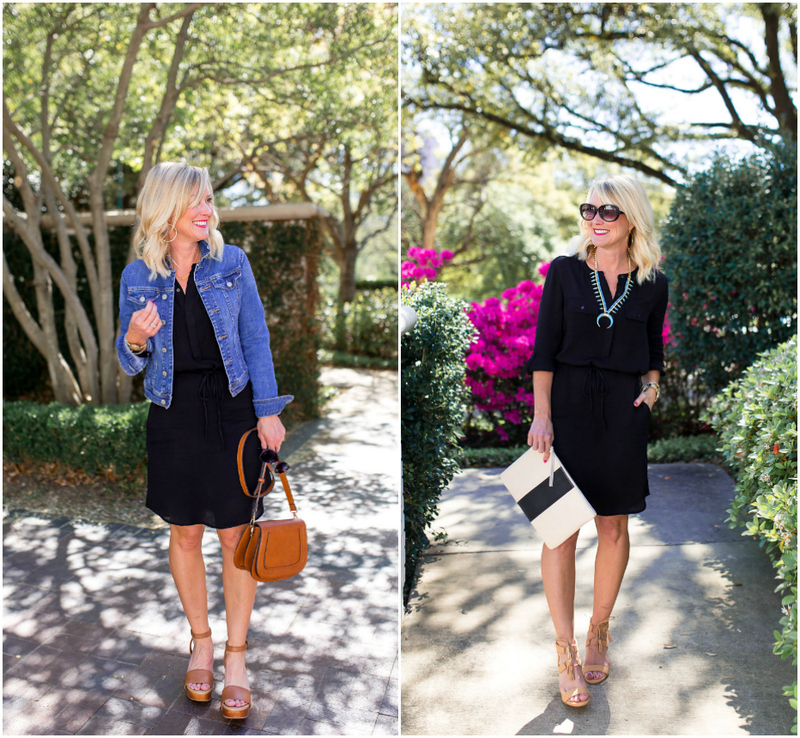 Day to Night | Black Shirtdress | hi Sugarplum! Dresses are the home equivalent of a ‘bed-in-a-bag’…..pretty much your entire outfit in one. 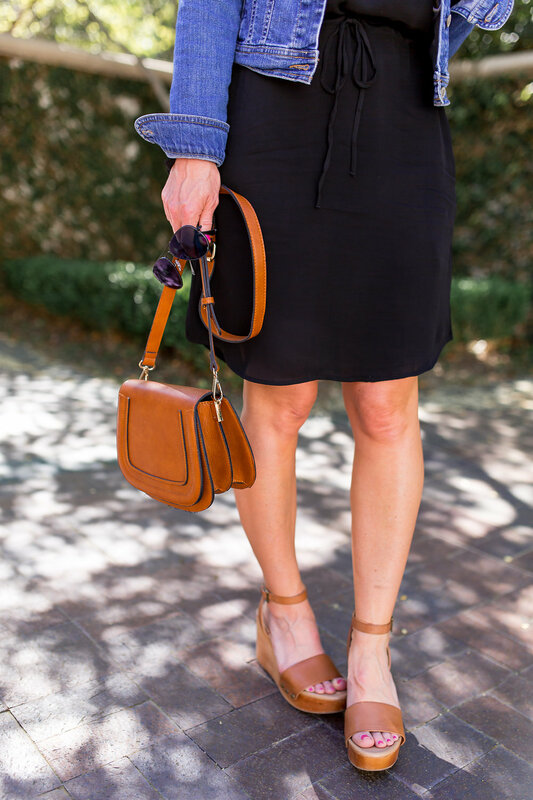 Which doesn’t mean they aren’t as versatile as separates, especially when you go with classic shapes like a sheath or shirtdress. 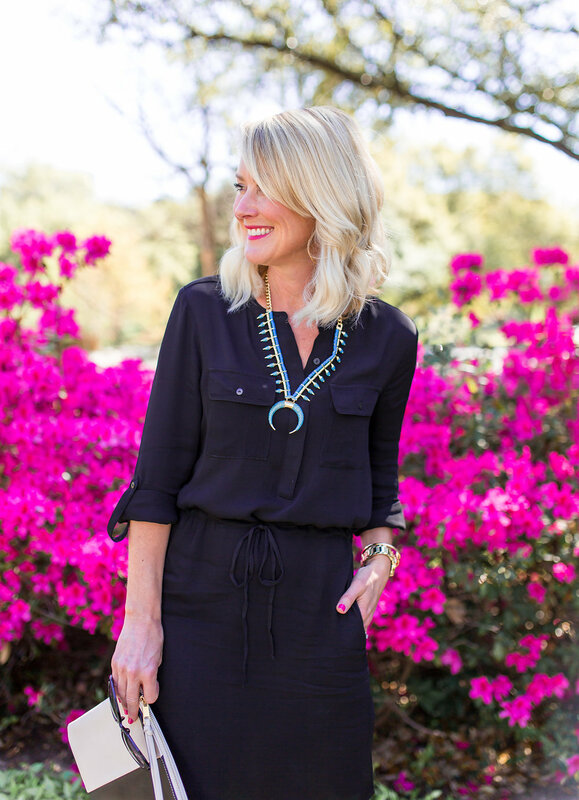 With a few accessory changes, and a shoe swap, this dress is good for Day to Night. 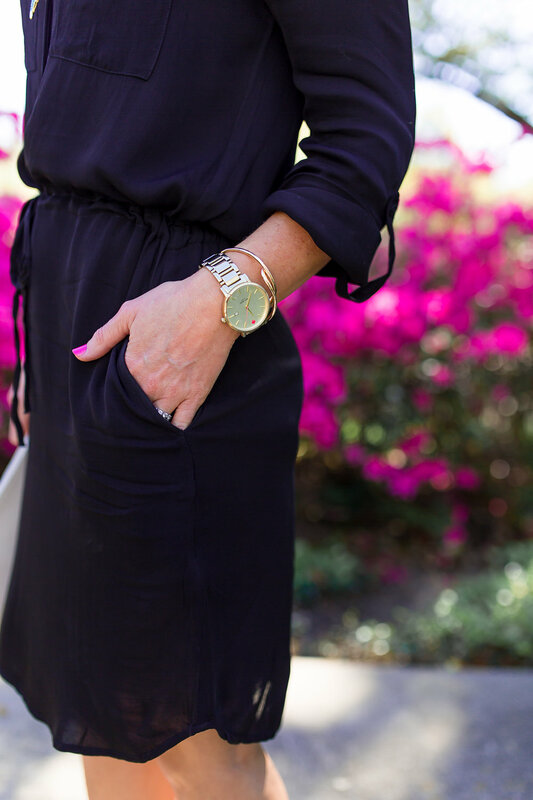 I love the laid-back vibe of this dress, but the drawstring waist gives it a flattering fit, and the flap pockets and roll-tab sleeves up the chic-factor. The dark color and drapey material make it perfect for a night out, with a statement necklace and sassy shoes. I’ve been a fan of Lucky Brand shoes for years (my favorite knee boots and beloved plum booties are both Lucky Brand! ), so I wasn’t surprised by how much I loved these tassel-tie sandals. They are incredibly comfortable, and add just enough personality without being too trendy. Fit Tip: The shoes run true to size for me, and come in a few color options. What did surprise me though, was the clothing collection on the Lucky Brand site! 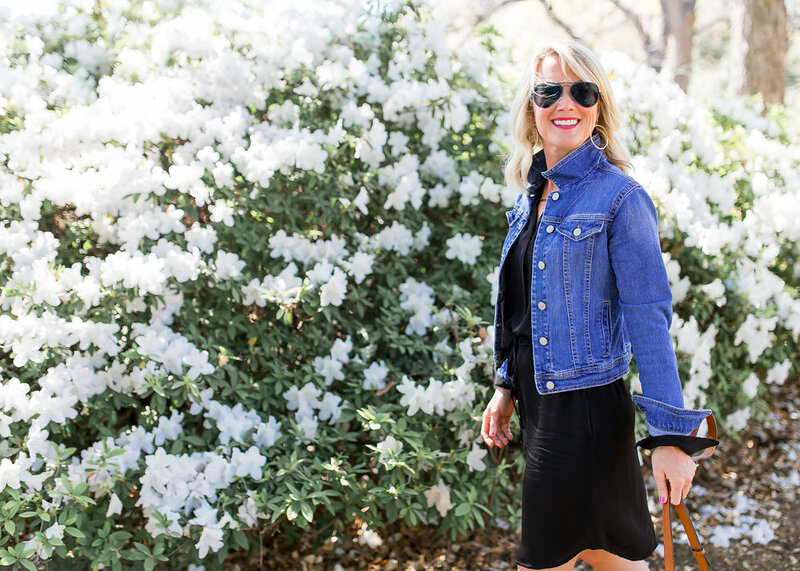 I thought they were mostly shoes, jeans, and boho-style tops, so I was amazed to find so many classic pieces like my shirtdress, this floral shift dress and this vibrant safari blouse. 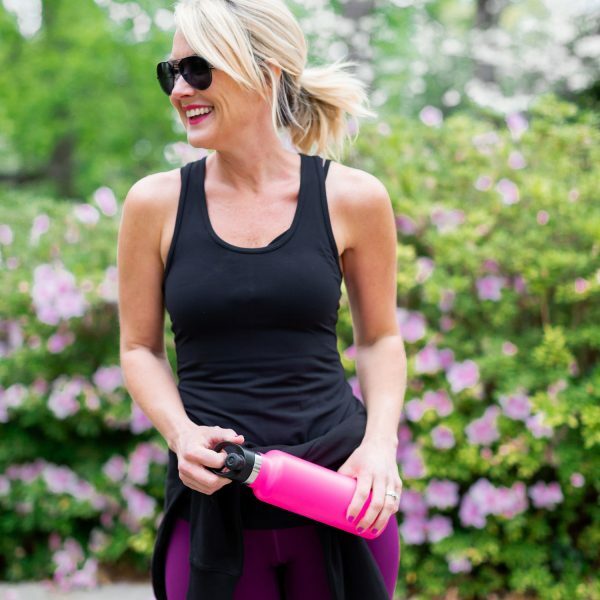 Fit Tip: The dress runs true to size, I’m wearing an XS, and the drawstring allows me to get a custom fit at the waist. 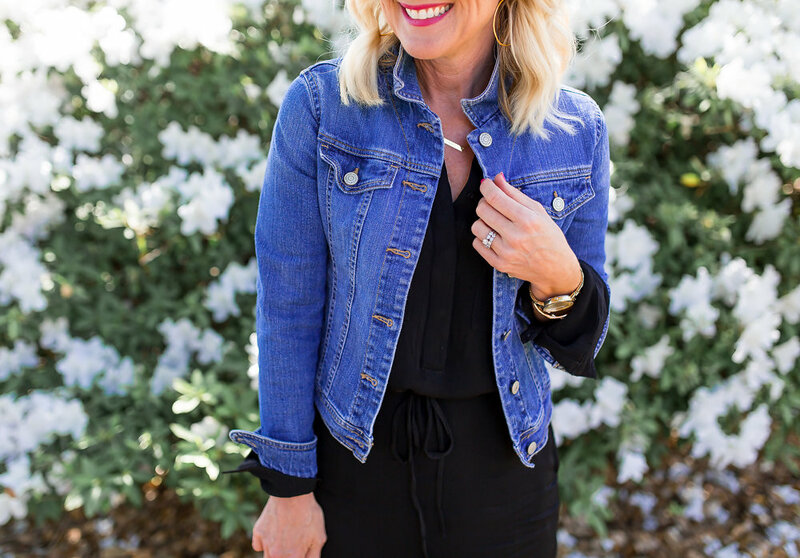 For an easy day or weekend look, I swapped the heels for neutral wedges and added my trusty jean jacket! The whole thing screams, ‘Spring!’, doesn’t it!? When Summer comes, I’ll lose the jacket, and add flat sandals or even sneakers, for an even more casual style. Lucky Brand even carries a great assortment of accessories like jewelry, handbags, and scarves, as well as a full Mens department. #whoknew! 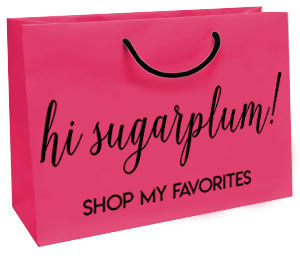 Are you a pants and jeans, or skirts and dresses kind of gal? Either way, you’ll find a ton of options with Lucky Brand, and right now, all dresses are 30% off! Are you as surprised as me by the large assortment of darling clothes they offer?! See more Day to Night looks here, and click here if you’re looking for more Work Wear. 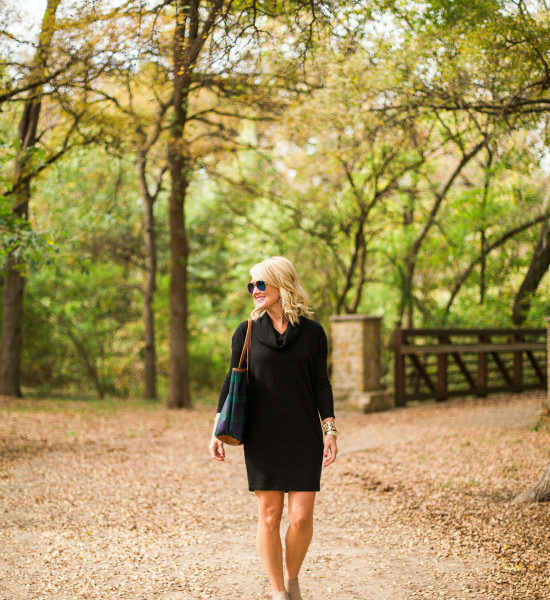 Love the look – I’ve styled a black dress in a similar way to you for a day-to-night outfit. 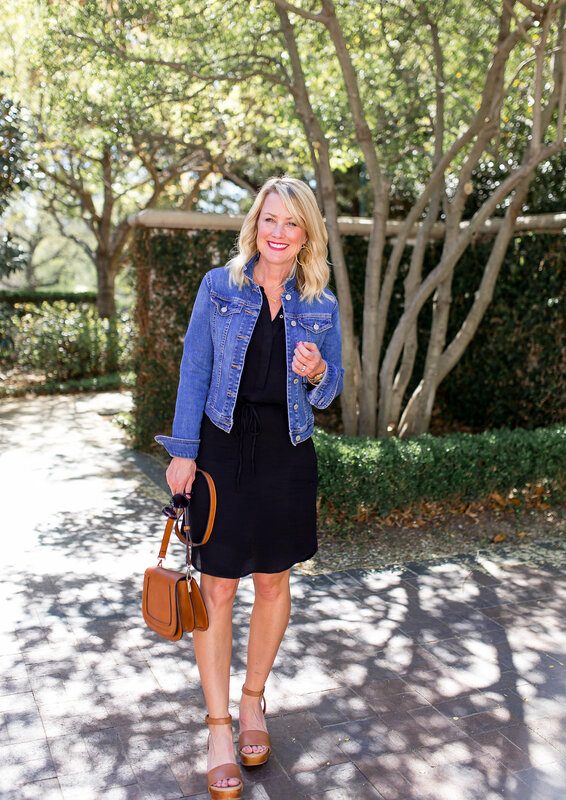 Black dresses are great with denim jackets. Um, now I need this dress. Like yesterday. So cute! I never thought of a shirt dress working dressed up for night. I have a dozen black dresses in my cart but I guess I need to pay attention to this style. It is my favorite style after all. 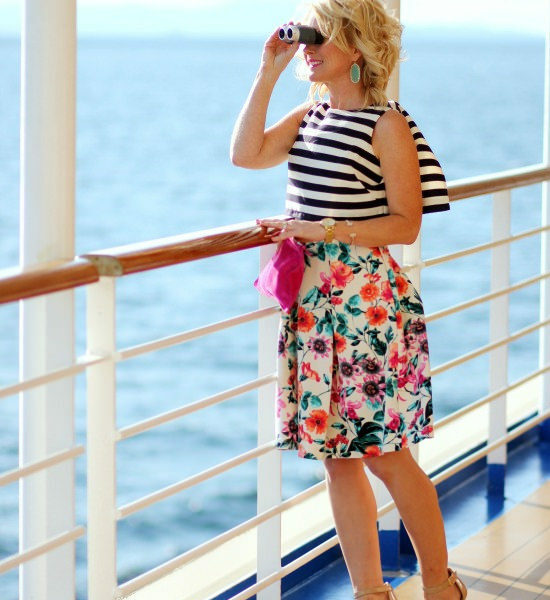 I love how you dressed this up two ways! They are both fabulous… That necklace is perfect for spring!!! Cassie-you crack me up! 😆A bed in a bag is the perfect way to describe a dress, but I’ve never thought of it like that before 😉 I love dresses too, but don’t wear them as much as I’d like; first because I live in Colorado and the weather isn’t nice enough all year round to wear them and second, because I like my dresses to go at least to my knee, which is the perfect length but sometimes hard to find. 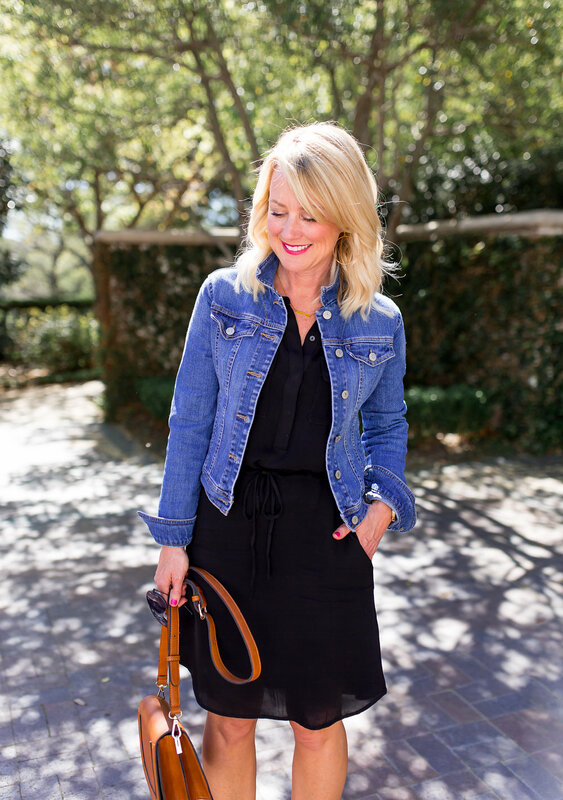 Love the jean jacket over the dress! So cute!! I clicked thru to the website. There, the dress looked rather short; tunic length. Did you order a larger size to get the length or is it actually near knee length in person? This dress is ADORABLE!! How tall are you? The dress appears much shorter on the model. I’m about 5’4″ and the dress is plenty long…the online model must be quite tall!!! Love this shirt dress on you! Both ways are cute, though I am loving the teal necklace you paired it with in your date night look. So cute! I’m definitely a dress/ skirt kind of person when the weather is warm. Love the dress on you! It does look considerably shorter on the model. I actually emailed Lucky, and they told me the model is 5’6″. 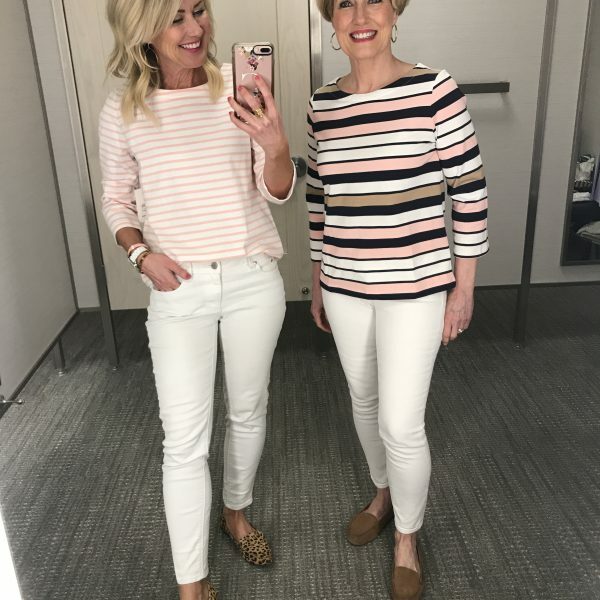 I read several reviews saying fabric looks cheap and wrinkles very easily. Any thoughts on this? I know this is a sponsored post but am hopeful for some honest guidance. Too many bloggers are just “loving” things for freebies. I feel like you would be fair with your readers. It’s just the right thing to do. I wish I could pull of dresses. I have no confidence even though I do have great legs…if I do say so myself. he he I have no waist and things fit funny so I haven’t been able to find a go to dress that I love! I will rock some shorts though! The statement necklace is fab! On the ‘like to know’ u posted some self tanning towelettes – how did u like them compared the lotion u use? I’m thinking i might get a more even coverage with them.